Despite Android's significantly larger installed base, iOS continues to dominate in monetization with a five-times-greater return rate for developers —a sign that Cupertino's market segmentation strategy is paying dividends for application creators. For every $1.00 in app download revenue earned by iOS developers, their Android counterparts earn just $0.19, according to data compiled by Business Insider. 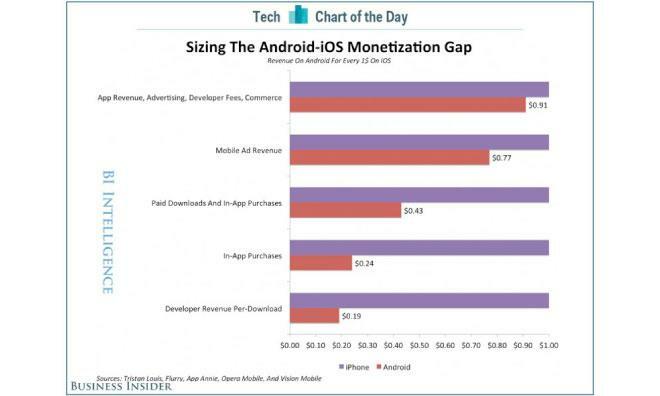 The gap for up-front and in-app purchases is slightly narrower, with Android bringing in $0.43 for every $1.00 on iOS, while advertising revenue is the closest at $0.77 on the dollar. The data, collated from several sources including app analytics firms Flurry and App Annie, is the latest evidence that while Android may be winning the battle for market share, Apple is winning the war for user engagement. Apple customers use their devices more often and are more willing to pay for content. Last month, a report from major Facebook advertising firm Nanigans said that ads on Apple's platform posted returns nearly 1,800 percent higher than the same ad running on Android. In fact, putting money into Android netted advertisers a negative return on investment, to the tune of a 10 percent loss. "Audiences cost more on iPhone, and the reason is that it's worth it," Nanigans SVP Dan Slagen said at the time. "Typically, we're not looking to acquire one-time customers, we're looking to invest over time...so we pay more up front for better long-term results." Time and again, studies have shown that Apple customers simply use their devices more often and are more wiling to pay for content. Web analytics firm Chitika found earlier this year that seven out of every eight internet-connected tablets was an iPad, while Flurry Analytics noted that iPhone users spend an average of 19 cents per app downloaded against just 6 cents per download for their Android counterparts. Apps are not the only storefront where Apple dominates. The iTunes Store accounts for 67 percent of digital television purchases and 65 percent of digital movie sales, as well as 63 percent of the worldwide digital music market.